Of all the software synthesizers to come along the past thirty years, these are the first to truly blow me away. 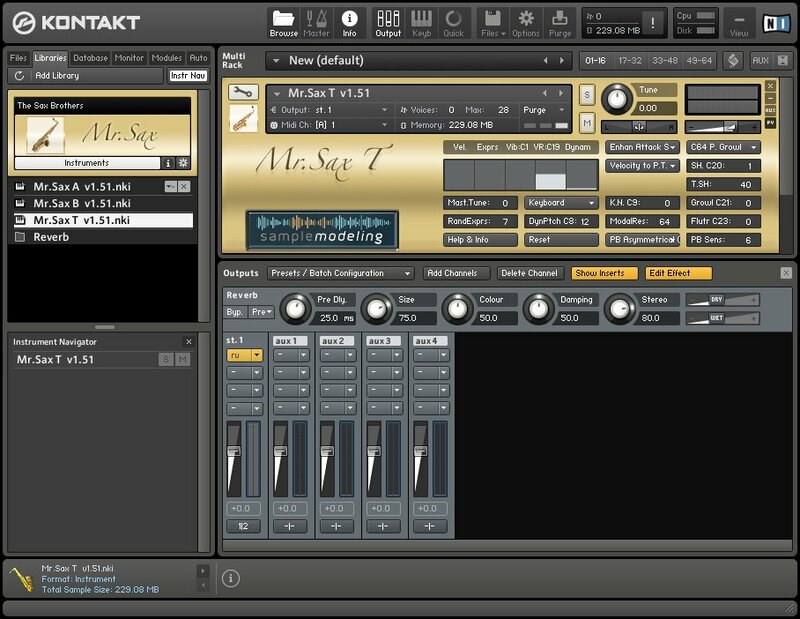 It all started with Mr. Sax T, their tenor saxophone implementation that, well... sounds like a real saxophone... not just because they recorded a real one, but because it adds all the control nuances needed to recreate the different timbres to go with volumes, effects like growl and flutter tongue, random expressions that just kind of 'happen' with a real reed (making the sound less uniform) and other complex synthesis methods nothing else has ever come close to. Within a year of it's release, it was followed by it's brothers, Mr. Sax A, and Mr. Sax B -- Alto and Baritone respectively. Upgraded to the newer tech of it's new brethren, the three are released together under the name "The Sax Brothers. They all sound amazing, though it does take a bit of dialing in to get them sounding 'just right'. The current release (as of time of this writing) comes with and requires Kontact Player 3.5 or newer. Since I already own Kontact Player 5 that's what I run it in for single voice testing; though much like Aria it runs well as a VST plugin under Reaper, which is where most of my experience lies. Configuring the EWI USB for "The Sax Brothers"
The first thing I suggest if you're going to truly enjoy these with the EWI USB is to make a few configuration changes by going into Aria's menu, "Tools -> EWI Configuration". You can refer to the screencaps provided to the right for how I have mine set up. On the "Setup Controls" tab I suggest setting breath gain to 64, cranking the devil out of the bite sensor gains because "The sax brothers" barely obeys pitch bend (like a real sax I supposed), the pitch bender gain I suggest a little below middle - around 50 - that setting is for the thumb benders which we're going to remap in a second. I find a slightly higher key delay of 9 to not really compromise playback, and makes the 'octave squawk' while playing much less pronounced, if not eliminating it completely for me. For "Performance Controls" the only real change I do is setting the Transpose to +22 which tunes it to Bb. This means no transpose is needed to play tenor sax parts in Mr. Sax T, while in Mr. Sax A and B you simply raise it five steps to instantly be in tune for Eb. Note that +22 is NOT a normally available option, and requires that you edit the XML for Aria or use our custom skin for Aria to make it available. In "Controller Config" most of the settings should remain at the defaults, but I highly recommend remapping those thumb pitch benders to controllers 21 and 23, which corresponds to "growl" and "flutter tongue" in The Sax Brothers. This will give you much more control over your sound. As impressive as "The Sax Brothers" is, out of the box it can sound a bit clunky and flat. The first thing you can do to clean that up is to click 'output' in Kontakt, and in the first row of output controls use the first dropdown to add "effects -> Reverb". Hit "edit effect" and then select that dropdown again to see the controls to change things like size and colour. Generally you have to play with these to dial it in best. A real saxophone has a lot of reverb the soft-synth lacks. Adding reverb really dials in the experience. Next there's a vague control labelled "K.N. C9:" -- That's "key noise, controller 9". Key noise tries to replicate the sound of the mechanical keys in a sax opening and closing. To my ears, this sounds like arse, and lacking a controller 9 device I can't quite control it in realtime. My advice is to turn this all the way down to zero. It's actually not too bad in Mr. Sax T, but in Mr. Sax A it sounds horribly broken; if a Sax made noises like that, I'd be worried it was falling apart on stage. Over from that is "RandExprs" -- random expressions. I suggest turning this all the way up. Likewise turning up "PB Sens" -- pitch bender sensitivity -- helps it actually DO something with the bite sensor, garnering you maybe 20 cents range on that. 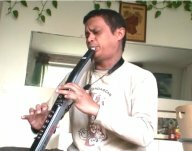 One of his earliest videos with the EWI USB, he's overblowing the instrument a wee bit which is a common problem with this model, which is why it sounds a bit more artificial than other recordings. Not is fault, we all do it at the start; even experienced EWI players find the USB model a bit... restrictive. This is why I ended up drilling out the plastic on mine to pass more air. Even with that issue, this is the video that made me go "I WANT IT!" on both the EWI USB, and Mr. Sax T.
Much more recent performance, he's no longer overblowing the instrument. One of the best performances with Mr. Sax B I've heard, makes me feel like a rank amateur. This is Mr. Sax T being driven by a "szaxe", which this gentleman made out of a Yamaha WX-7 wind controller (one of the EWI's competitors) and some alto clarinet parts. Really cool looking, and seems to play well too. Impressive work all-around, and great example of Mr. Sax T in action. This is a much simpler solo performance under 'real' conditions, which I think shows off the software much better. Charles does a good job on a nice little solo action, tossing in a few familiar snippets at the end. This is probably closer to the results one can expect with a normal home setup. As you can hear from the above videos the software sounds really good, and while the price may seem prohibative, in my opinion it's worth every penny. I give it eleven stars out of ten. * NOTE * to the artists above, I tried to contact you for permission to link to your videos, and did not recieve a response. If you do not wish me to link to you, please let me know via the Contact Form and I will take them down immediately. is in no way associated with Akai Professional, and this is NOT an official website for their products.